Sculptor Bill Reid's Sun Ray pedal car is displayed in the Atrium lobby at First Presbyterian Church, 716 College Ave. 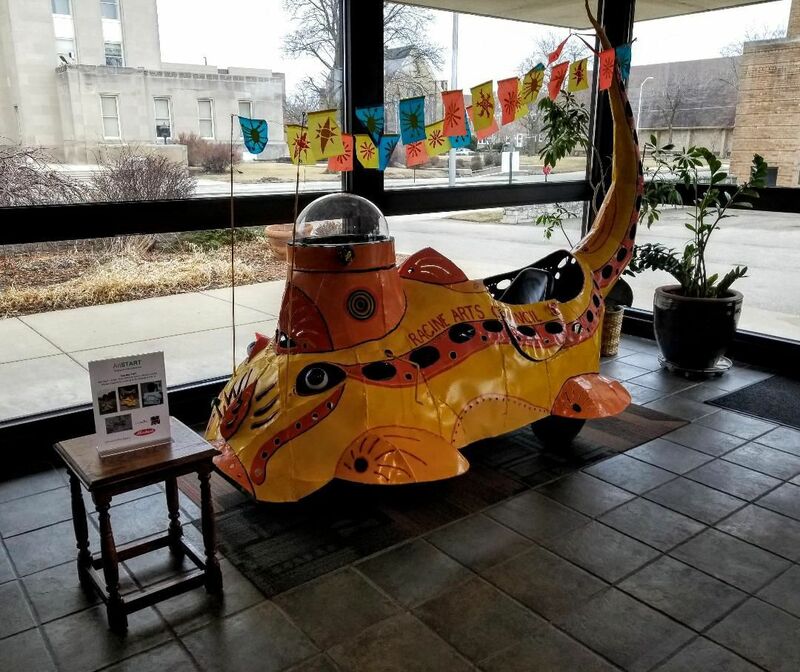 It is part of an exhibit featuring the work of local artists titled "Established & Emerging" that is being hosted by the Racine Arts Council, which recently moved its office to the Atrium. 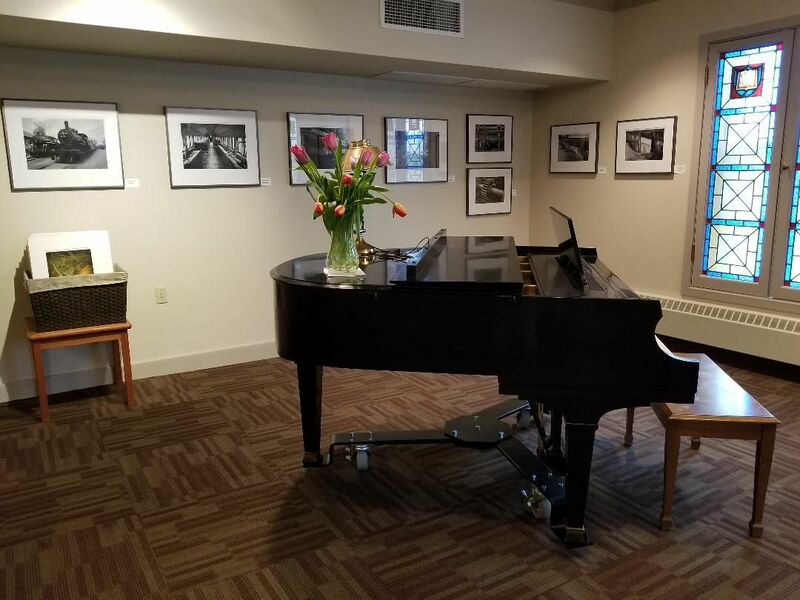 The Racine Arts Council is hosting a new exhibit titled "Established & Emerging," featuring the work of local artists, in the Atrium at First Presbyterian Church, 716 College Ave. The exhibit will be open to the public during the Get Behind the Arts studio tour from 11 a.m. to 5 p.m. Saturday, April 27. The Racine Arts Council has a new home and is celebrating with a new exhibition titled “Established & Emerging,” featuring the work of area artists of all ages created in a variety of media. In February, RAC moved its office from Sixth Street to the Atrium space at First Presbyterian Church, 716 College Ave. And on April 5, it opened “Established & Emerging” in a gallery space at the Atrium during Downtown’s First Friday event. The exhibit will run through May and will be open to the public during next weekend’s Get Behind the Arts studio tour, from 11 a.m. to 5 p.m. Saturday, April 27; as well as during the next First Friday event, 6 to 9 p.m. Friday, May 3. There is no admission fee. “Established & Emerging” includes work in colored pencil by Rebecca Venn; black and white photography by William Bruce; pencil drawings by Claire Zietsma; color photography by Kathi Wilson; wood carvings by Joyce Fleming; and a collage by students of Gilmore Fine Arts School. Visitors can also see sculptor Bill Reid’s “Sun Ray” pedal car on display in the Atrium. This exhibit is the first of many RAC plans to host in different gallery spaces throughout the community. By expanding beyond its own ArtSpace gallery, RAC aims to connect more people with the positive power of art, according to the council’s new executive director, Kathi Wilson. Hosting exhibitions is just one of the ways the nonprofit organization has worked to do so for more than 50 years. The Racine Arts Council carries out its mission of encouraging, supporting and advocating on behalf of emerging and established artists, artistic groups and young people interested in the arts through a variety of programs and projects. They include ArtStart, which brings artistic opportunities to under-served audiences; LINK (Lonely Instruments Need Kids), which provides donated musical instruments to elementary and middle school students; and ArtSeed, which issues grants to local artists and nonprofit organizations for arts projects and programs. ArtSeed is currently accepting grant applications and RAC is holding a free, ArtSeed grant-writing workshop from 6-8 p.m. Wednesday, May 1, in its office at 716 College Ave. Those interested in attending must RSVP to director@racineartscouncil.org. The deadline to apply for this year’s ArtSeed grants is May 20. More about this program, including qualifications, is available online at www.racineartscouncil.org/artseed-grant-program. As it moves in new directions, RAC is also working hard to continue one of our community’s long-standing artistic traditions, the Monument Square Art Festival. In its 57th year, the 2019 MSAF will take place June 1 and 2 and bring more than 50 artists from around the country to Downtown’s Monument Square. They’ll be showing and selling artwork in a wide range of media, from painting and photography to ceramics, textiles, jewelry and much more. Festival hours are 10 a.m. to 5 p.m. Saturday and 10 a.m .to 4 p.m. Sunday. There is no admission fee. New to the MSAF this year is a BiergARTen, which will feature local brews from the Racine Brewing Co., as well as live entertainment by Milwaukee’s power polka band The Squeezettes. Festival goers can enjoy beverages and food in the BiergARTen Saturday afternoon and evening. And don’t forget to wear your dancing shoes. These are just some of the ways RAC works to support Racine County’s vibrant arts community. If you, too, believe in the positive power of art and would like to support the council’s efforts, membership is open to all and costs $20 per individual or $50 per organization. For more information go to www.racineartscouncil.org or call 262-635-0261.